I don’t know about you but my dad and my husband have always been the most difficult to buy gifts for. Their lists of wants is always so short and their list of needs is non-existent. When they need something throughout the year, they just buy it because they obviously need it for a reason. I’ve always been at a loss for what to get hubby but there is one thing I’ve done every year since the kids were little that has always been a winner: a birthday journal. Several years ago, I read a story in a major magazine about a journal a family had created for their father. As young children, they would draw a picture or write something in the journal. As they grew older, they continued in the form of a letter, story or note of thanks. As adults, they still contribute and it is something their father treasures greatly. It sounded like such a fantastic idea and it was something that couldn’t be bought. Except, of course, the journal itself. With a vision of what I wanted, I set out to find a journal deserving of this amazing husband and father. What I found was…well… girly. Store after store, every single writing notebook and journal I discovered had flowers or something “pretty’ on it. 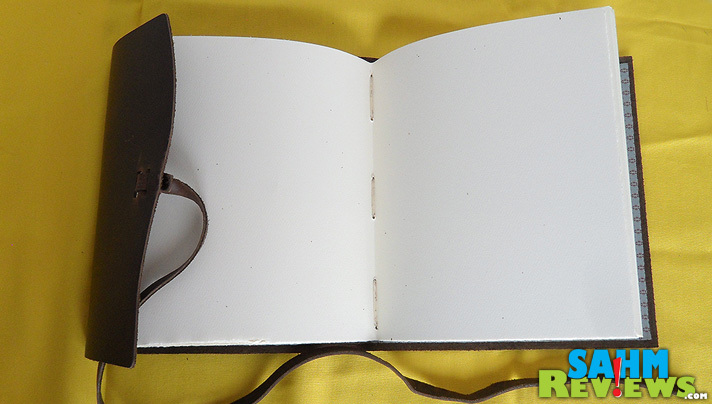 Wish I had realized there were sites like Rustico Leather with attractive leather journals. Definitely more manly. My first entry was hubby’s birthday in 2005. The first page was reserved for me where I explained the idea along with my personal thought, feelings and birthday wishes. Our youngest wasn’t even six months old and our oldest had just turned two. I took the opportunity to outline their hands since they were obviously too small to write. Miss M “wrote” her version of Happy Birthday. It only took a few years before they were each able to really participate. In subsequent years, they’ve drawn pictures and written something. The outline of their hand is something we still do. My, oh my, they have grown. Not just physically but also emotionally. When they wrote in his journal this year, they put great care and concern into their words. After so many years, they understand the importance of this simple bound book. Our only rule is that as we are preparing to write, we are not allowed to read what we have written in prior years. It has to be heartfelt and original. Each year, I use it as an opportunity to chronicle the time since hubby’s last birthday and reference adventures and achievements, opportunities as well as hurdles. I always make myself scarce when I give it to him so he can read it without someone watching his reaction. It’s one of the few gifts that I have given him that I’m truly proud of. As hubby’s birthday approached this year, I gleamed at the Rustico leather journal, passport cover and luggage tag and I recently received and lamented not having it long ago. Not only would he have a memento to remember the years but would also have a passport cover and luggage tag to remind him of it each time he traveled. Alas, we still have pages open in our current journal but when we run out, we’ll be switching to something like this instead. If you’re looking for a priceless idea for the man in your life, consider the birthday journal. I think this is a great gift idea for a father-to-be! Is your man hard to buy for? What types of gifts are always winners? What a great idea! I bet your kids enjoyed helping you with it too! He’s really going to love it! This is a very original gift idea! I never even thought of something like this–and it looks very manly. Great gift idea! What an awesome idea! My husband is the WORST person to buy gifts for and he usually ends up just getting gift cards which I think are a cop-out. what a great idea! My dh is hard to buy for too! But this would be a wonderful idea for our grandkids to add in pages of a journal every year! That is so nice! I’m always scrambling at the last minute to get something for his birthday (great wife, huh?) which absolutely makes it hard! This is a great idea. I like the passport and luggage tag. Great ideas. I really like your idea of not reading what was written before. I think that’s going to be such a treasured keepsake. Um forget manly! I want one for me! What a beautiful journal. That’s actually a really great idea. My husband’s always talked about writing a short story. I think this would be a lot more personal than just typing it up. What a wonderful idea, something “dad” can treasure forever. I’m pinning this! Such unique ideas that I’d never considered! My husband travels for work sometimes and a custom luggage tag would really remind him of home. What a sweet gift! Love that it can be looked back on over time. Perfect, my husband is hard to shop for but I know he would love items like that. That’s a really thoughtful gift idea. The men in my life are difficult to buy for as well. I love these for a gift. Very timeless look and are perfect for the man that has everything. Aw!! This Is A Gift My Hubby Would Definitely Use Thank You! My husband is IMPOSSIBLE to shop for, and I honestly think I might be getting him a birthday journal this year! I had never heard of the idea but I absolutely love it. Thanks for the idea! Such great ideas. 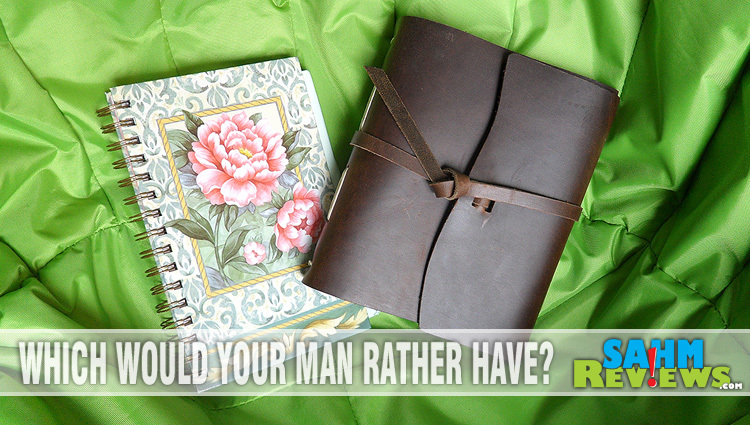 I think my husband would treasure a journal. I just adore the journal idea! That is such a great idea. I’ve never thought of something like that before. That would perfect for hubby who is extremely difficult to shop for. Since my toddler is only 2 it would be great to start with her. Thanks for sharing. Aww, this is a great idea. I know we have made things like handprint paintings, etc and they have gone over well, so I bet he’d love one of these. My Dad is so hard to buy for. He loves tech but it’s often out of my budget. He does travel a lot, so items like the luggage tags and passport cover would be appreciated I’m sure. I always struggle with gifts for the men in my life. Why are they so difficult to shop for? 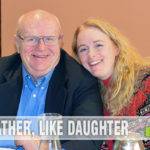 I’m going to consider these great ideas for Father’s Day this year! 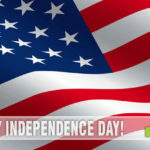 what great gift ideas for dads that travel for business and work. I like the passport and luggage tag. Great ideas. Thank you. I love how practical the gift is but it’s also got such a cool & manly feel! Anything tech-related is a win with my boyfriend. What a wonder gift idea. I will have to think about this for this birthday or maybe even Father’s day. Thanks!! What a fantastic idea! Very thoughtful & I think Those are the types of gifts that mean so much more than average store bought gifts. I also noticed everything in stores seems girly so I’m going to head over and check out Rustico for the Mr. This is such a cute and sweet idea! I’m sure it’s very emotional to see how the kids have grown through the years. These are such great ideas. I love the passport and luggage tag. I would totally want this for myself. That is a cool journal! I think this is a neat idea for my boyfriend who likes to write but doesn’t always allow himself time for it. What a creative idea! I have never heard of anyone doing this yet until I read your post. The memories this evokes are truly priceless. Really love those gift ideas. My hubby’s birthday is not till September but I really think he would love to have one of those personalized leather journals. My father is next to impossible to shop for. It’s such a challenge finding gifts he’ll love. That is a great idea for a birthday gift! I love the handprints, makes it even more special. Hand prints? A-dorable – I think that is an excellent dad gift. Too bad we just missed my husband’s birthday, but maybe for a Father’s day? What a great gift to give a loved one. I love bound journals because you can use them in multiple ways. What an creative and loving gift! <3 Those are usually my favorite types to gift the men in my life. My boyfriend is so easy to buy for.. he's obsessed with video games so anything inspired by the video game is something he'll love, without a doubt. You are so right, it is always difficult to find gifts for men. I like this idea of creating a journal. I think I will make my girls do that for father’s day. I would love to receive a journal from my wife. I guess i’ll go out and get one! Another really good gift idea for Dads – nice comfy sheets. Luggage tags sound so dorky, but you cannot believe how we scramble around looking for one when we travel and notice that our old one had fallen off. Having a few spare ones or a good quality luggage tag for a dad who travels a lot is a GOOD THING. Such a thoughtful gift and perfect for someone who enjoys writing. All great picks, I would pick the Passport cover and luggage tag then the journal. 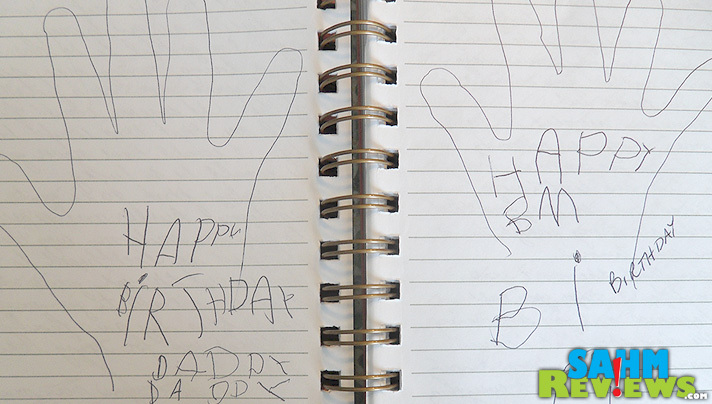 Those are great journals and I love the handprints! That makes it worth it right there. 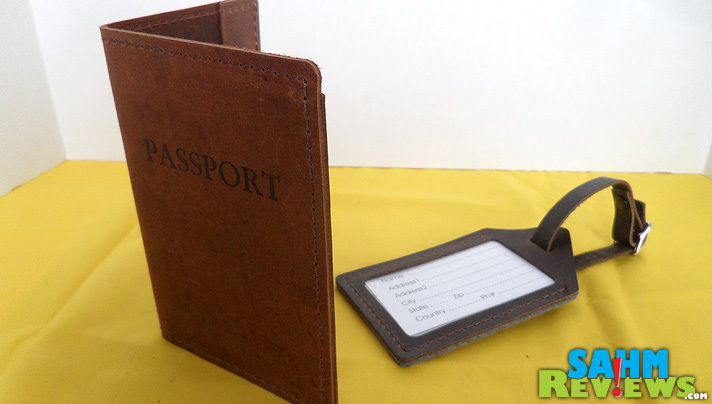 I love the leather journal, and the passport cover. I presented my son with a leather journal a few weeks ago and he loved it. Love that this is such a simple, yet meaningful gift idea! What a terrific and personal gift! Wow this is a great gift idea for dad, husband and grandpa. It’s so thoughtful and creative. I will be sharing this with my kids tonight. What a cute idea – definitely creative, and something different. I am not much for journaling myself, but I bet I could probably do it for my Dad or my husband. Thanks for sharing! The Best Birthday Gift for Dad- Love this idea! They are by far the hardest to buy for. This will m ake a great Father’s Day gift! Love the leather journal – more importantly my husband would love it too. Hey, i felt touched. This idea is really unique and worth trying. The Best Birthday Gift for Dad- Love this idea! Thank a lot! I like the passport and luggage tag. Great ideas. Thanks.